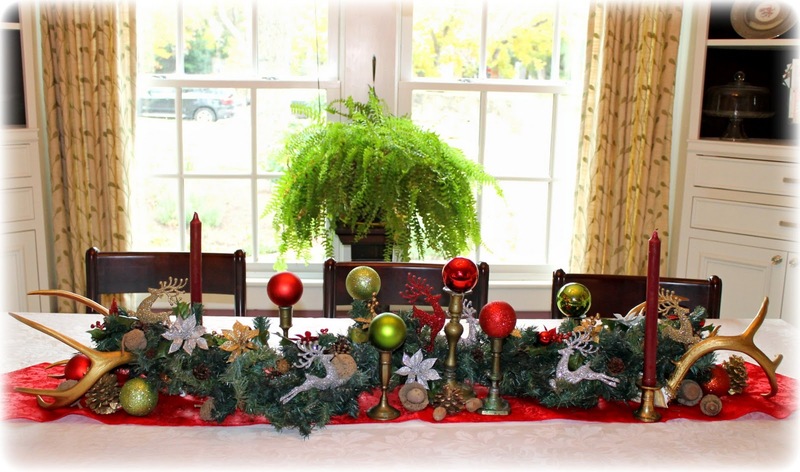 If you missed them, you can see Reba's Christmas Home Tour HERE, our sister, Elsa's Christmas Home Tour HERE and my own Christmas Home Tour HERE. Since Christmas is around the corner, I am really happy we could get in one more home tour before the big day, and I promise this one is full of eye candy. TRADITIONAL, BUT ALWAYS WITH A TWIST: My dear friend, Martha, allowed me to photograph her Christmas decor for the blog. I am very happy about this because I am sure many of you will enjoy seeing her decor. 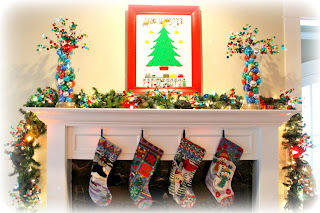 Martha's Christmas decor is like she is: colorful, bright, fun, unique, charming with a warm, inviting vibe. She likes traditional style, but she always does something to it to make it brighter and more fun. Her living room mantel is a perfect example. 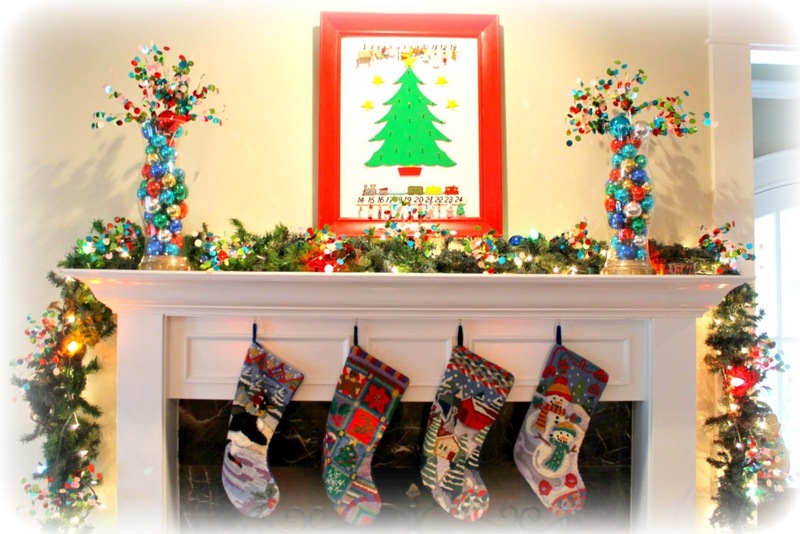 The center art piece is traditional red & green, but she found decorative picks with red, green, turquoise, silver, yellow, & blue reflective confetti to add more color to the setting. She filled brass based glass containers with bright ball ornaments in these colors and used the picks as burst of color on the top. 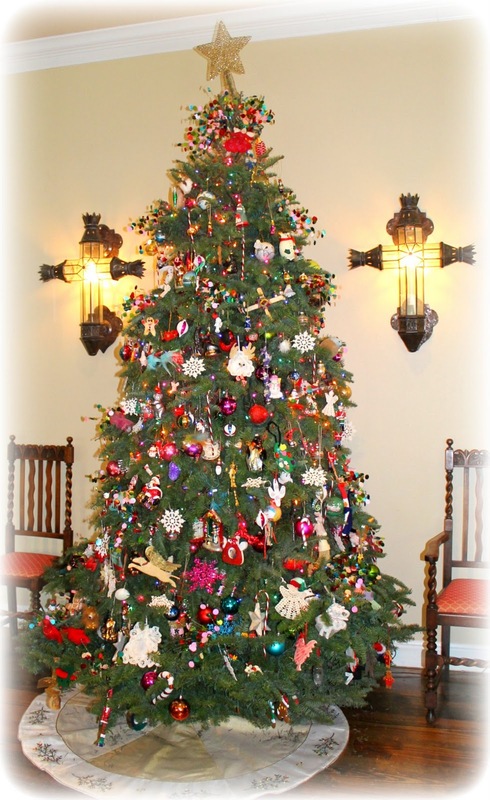 Once multicolored lights are added to the mantel's garland as well, visitors are sent a strong first message that this is a festive home. Martha has a relaxed approach to decorating. She uses whatever looks good to her. The stockings are not all the same. Some people might change out the stockings to be the same for a so-called "designer" look but Martha avoids uniformity. There is a story behind the stockings not matching and Martha will be glad to share it. 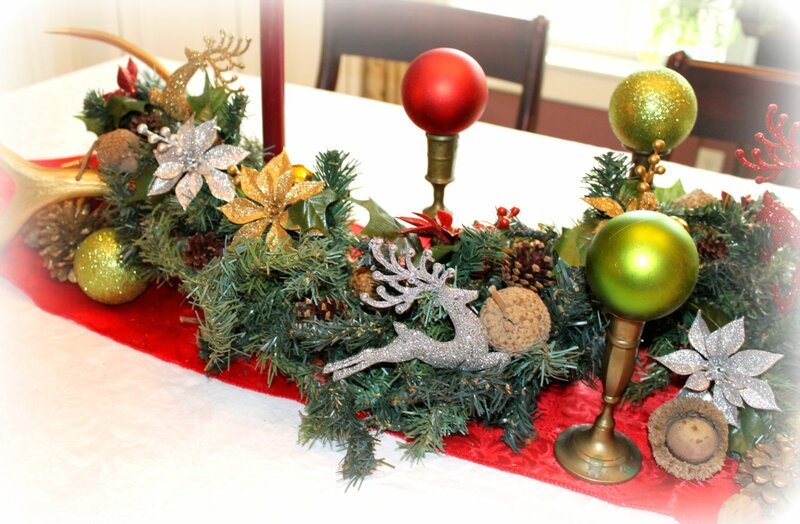 NOTHING MEEK ABOUT THIS CHRISTMAS DECOR: Martha is vivacious and creative and so is her Christmas decor. 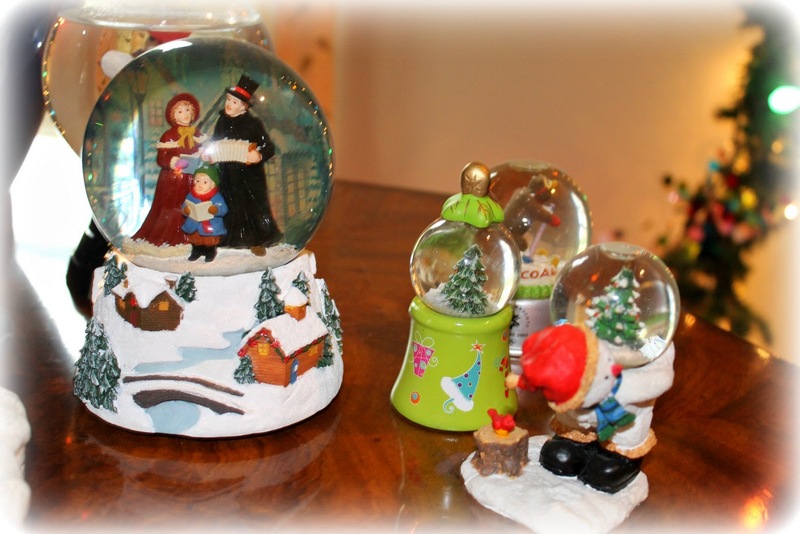 SNOW GLOBE COLLECTION: Martha collects snow globes and she puts out a large assortment of them on a table in her living room. FORMAL & JUVENILE TOGETHER? WHY NOT? This is a family home, not a museum. A very nice traditional snow globe can sit right next to a brightly painted juvenile one from the Dollar Store. 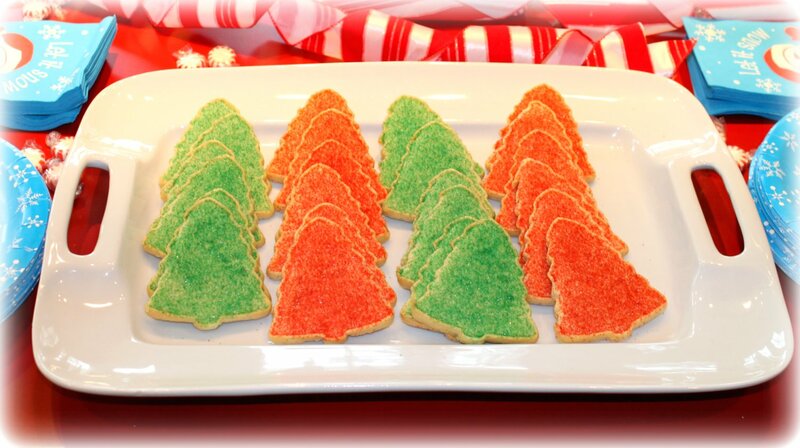 Again, no stuffy decorating rules here. 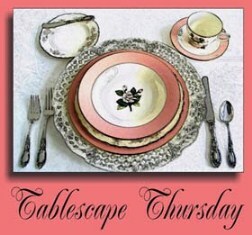 JOYFUL DINING: Purple walls, green chairs with a red, green and gold table setting. I had dinner in here last week when Martha hosted our Bunco club for dinner and it was a fantastic setting. Unfortunately, I forgot my camera that night so I took these pictures right before Martha was hosting a kids' party. 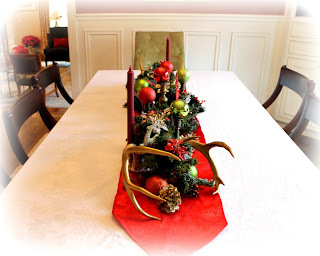 Martha is going to set her table again this week so I promise to update this entry with pics of her table set with her Christmas china. It looked FAN-TASTIC all combined so don't forget to come back to see them. You won't want to miss it. 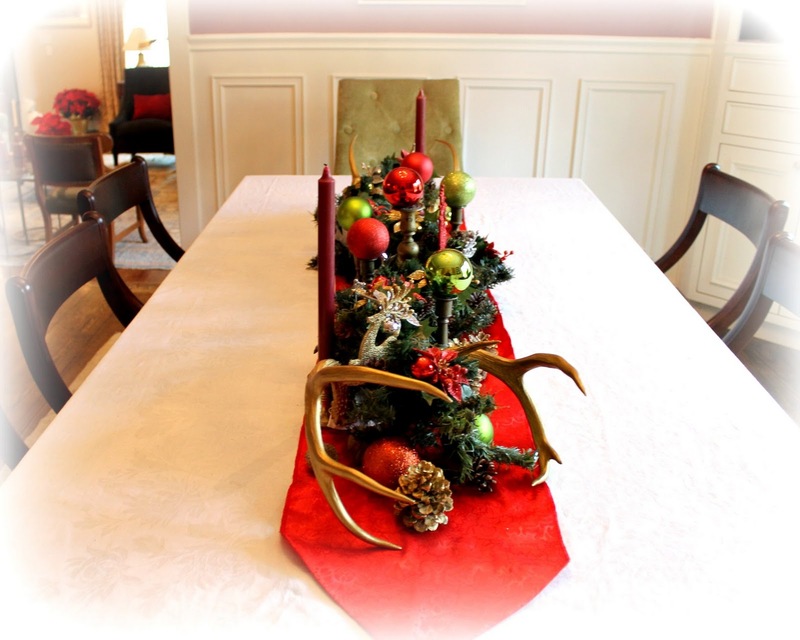 USING WHAT YOU HAVE: As I sat at dinner, I was fascinated by Martha's centerpiece. I don't know where she got the inspiration, but it all worked. She told me she went shopping around her Xmas tubs for stuff to use and borrowed the candlesticks from her mother. THE HEART OF HER HOME: They say the kitchen is the heart of the home, and it is definitely true in Martha's house. 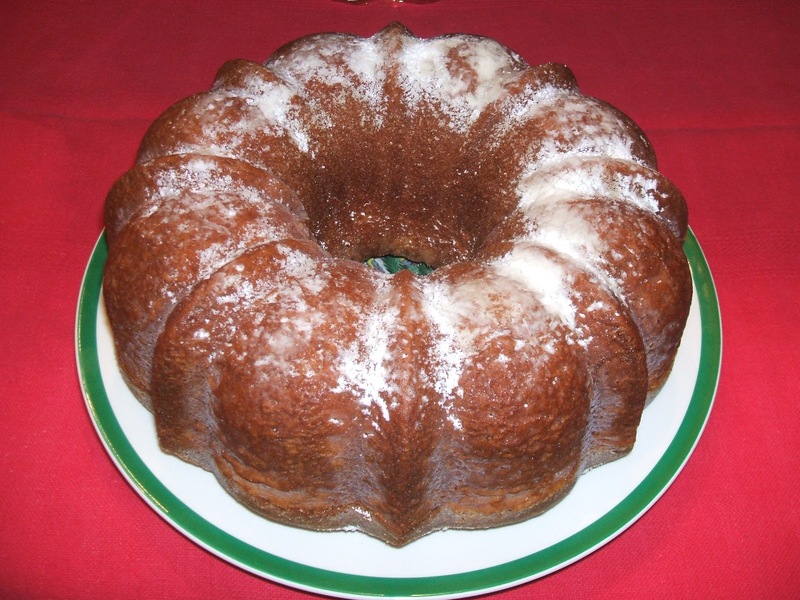 Martha is a good cook and during parties, people always gather in her gorgeous, predominantly white kitchen. It has high ceilings and a large center island with a lower section which can serve for kitchen dining if wanted. 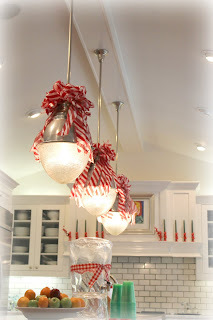 For Christmas, Martha put large red & white striped ribbons on her industrial pendants. So cheerful, right? 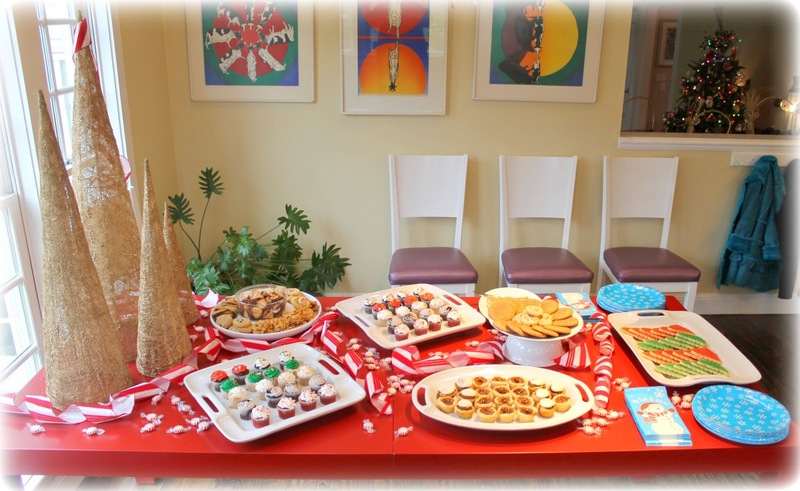 For the kids' party, Martha was making warm cider, put out a bowl of popcorn and was preparing water as a sugarless, healthy drink to offset the sugar overload at the cookie buffet table. 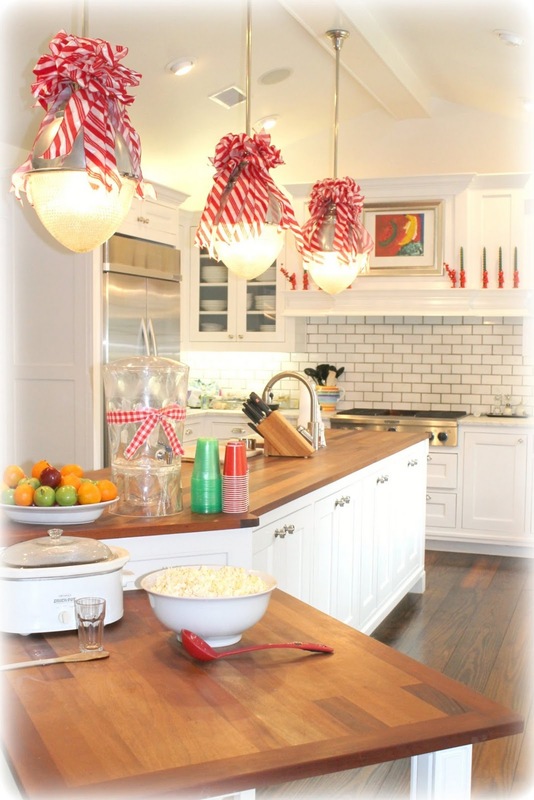 RED & WHITE: In addition to the red & white striped ribbons on the industrial pendants, she put out red candlesticks that look like toy soldiers with green candles on the mantel above her stove. 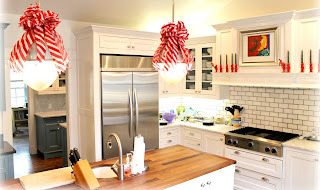 CLOSE UP RED & WHITE STRIPE RIBBON ON PENDANT: A section of Martha's kitchen has white cabinets with white carrera marble, another section has blue cabinets with black granite and the center island has white cabinetry with butcher block counter top. Even though the cabinets and counters change throughout the room, they all work together beautifully and the red and white stripe brings a holiday cheer that compliments the entire room. ONE MORE PICTURE: just because I took it. KITCHEN TABLE AKA COOKIELAND: Martha put out a large assortment of baked treats for the guests on her red family room table. The kitchen table is red year round. 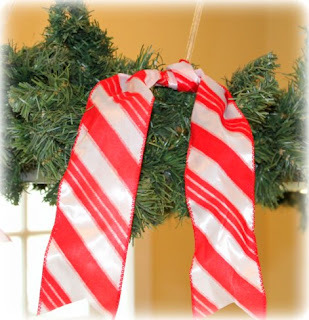 Martha painted it that color and I am guessing it played a role in Martha picking the red & white ribbon for the room. 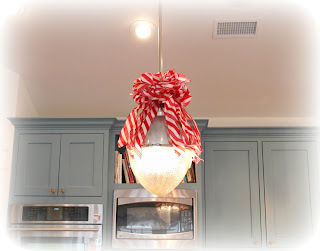 Martha has a modern light fixture over her kitchen table and she adorned it with garland and ribbon for Christmas. CLOSE UP RIBBON: Simple knots anchor the ribbon to the corners of the light fixture. 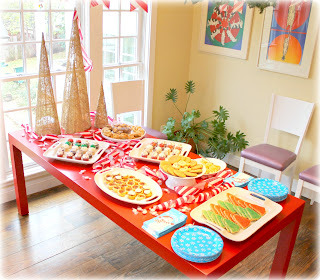 A FEAST: This is the spread Martha put out for the kids party. 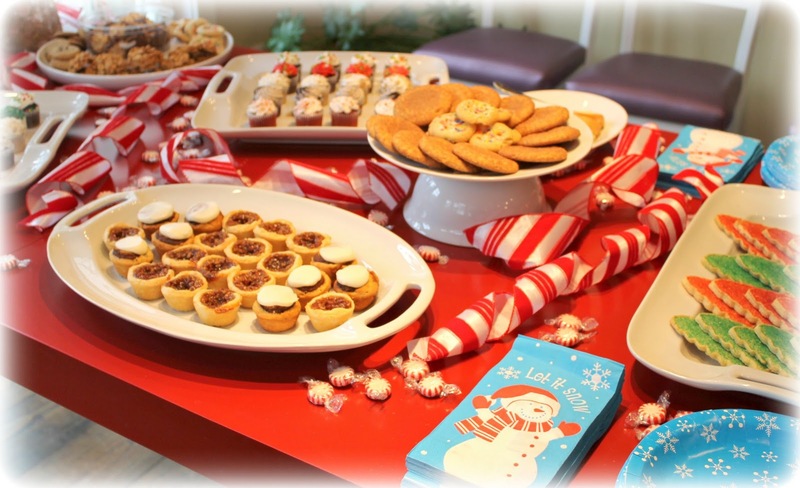 A HUGE assortment of cookies and baked goods. She saw the assortment at Wal-Mart's bakery and it gave her the idea for the table. 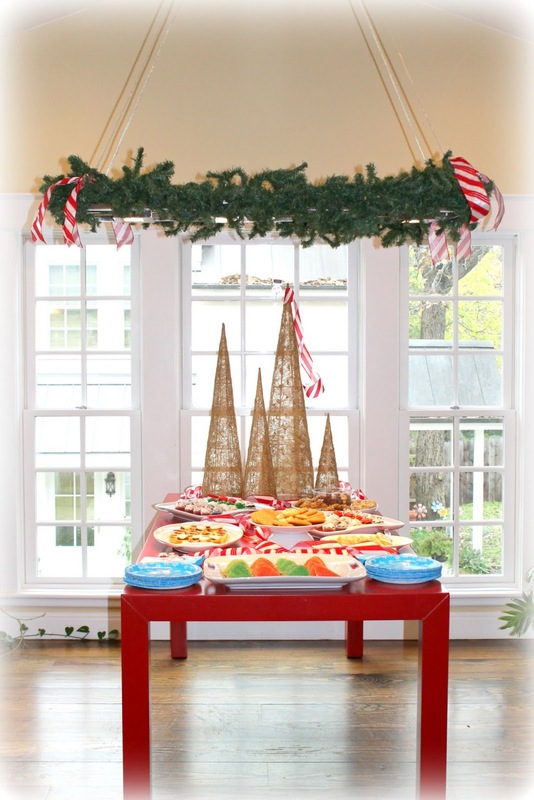 She used simple white platters and plates to display all the brightly decorated baked goods. 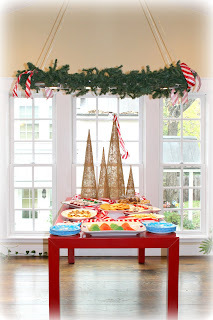 To brighten up the table she added curled strips of ribbon and sprinkled peppermints between the platters. Gold twine trees provide a focal point at one end. ANOTHER VIEW OF KITCHEN TABLE: The kids certainly had a great selection of treats at the party. When I commented on how much food she had for a relatively small group, Martha agreed and said she "went a little crazy at the store and pulled an Eldarose" meaning she bought way more food than she probably needed. Yes, I definitely tend to do that. It drives my husband nuts because we always have too much food leftover. By the way, I know you are noticing, yes, Martha has white and purple kitchen table chairs. The room is always colorful and inviting. She use to have a dark wood table and dark chairs in here and it didn't suit her personality as well. 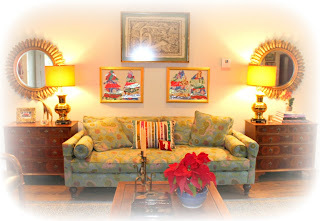 The bright prints above the chairs and the big colors are more Martha's personality. 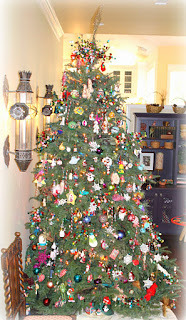 THE CHRISTMAS TREE: Martha put her Christmas tree in her family room this year off the kitchen. She said she wasn't sure she liked it there, but I thought it worked great. LOVE YOUR TREE: Martha's tree doesn't have a particular theme. It is bright and eclectic. 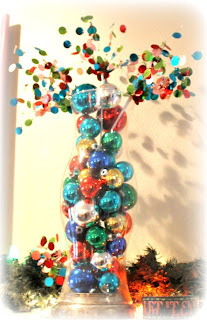 She uses the same decorative picks with bright multi color reflective confetti from her mantel on her tree. Because the picks have a lot of different colors, they help bridge all the various color schemes of the ornaments that otherwise would not match. ALL SORTS OF ORNAMENTS: Something great about an eclectic tree is that it never gets boring. 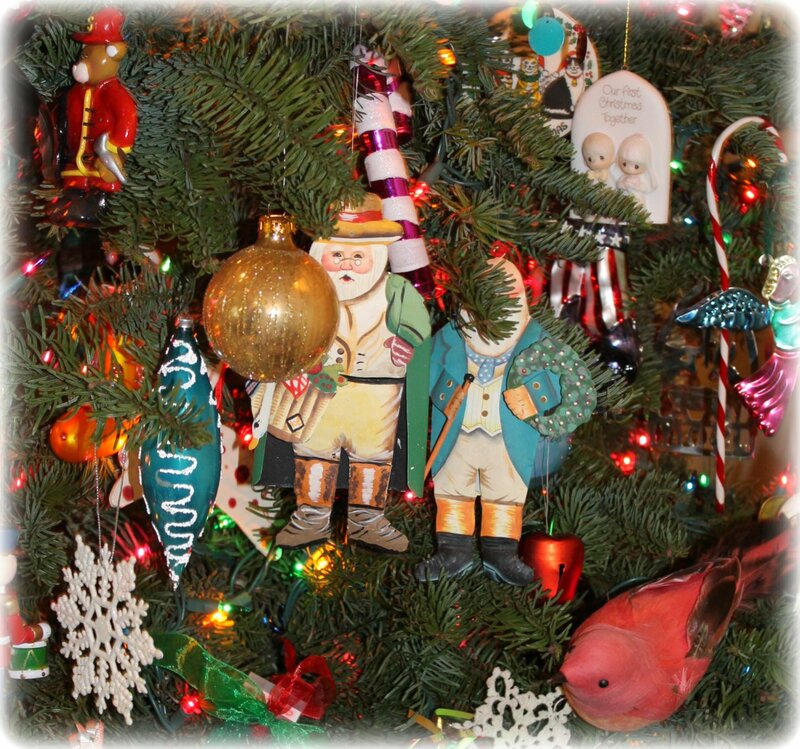 Whenever I stand beside Martha's tree, I notice a new ornament that I've never seen before and if I ask her about it, there is almost always a story that goes with it. 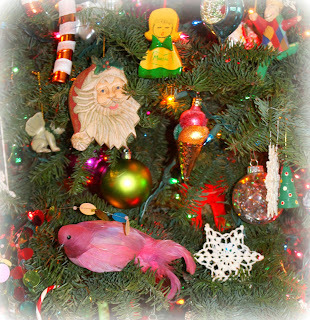 MARTHA'S CHRISTMAS TREE ART: When I was taking pics, Martha said she had a craft for my blog and she asked me if I had noticed her Christmas tree art and I said "No, where is it?" The funny thing is that it was hanging above her sofa in the living room where I had been seated for hours a few nights before at our Bunco Christmas party. I had seen her Christmas tree art, but I had thought it was folk art she had purchased. 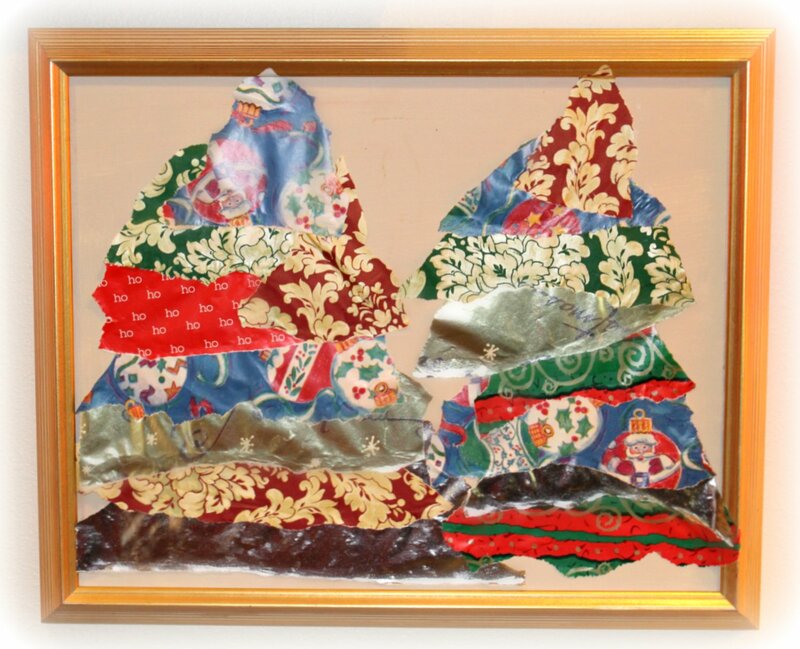 QUICKIE HOLIDAY DECORATING: Martha had hung 2 blank canvases in gold frames above her sofa months ago, hoping for some inspiration to make them into a display. 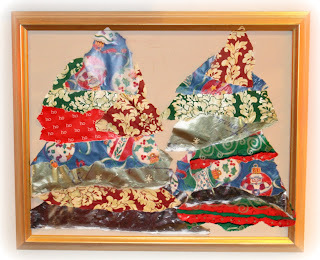 She felt the wall over the sofa needed something more visually to fill the space, but she wasn't ready to buy a piece of art, so she thought she might be able to make something. But, the canvases were left blank until the night of the Bunco party when she felt an urge to do something with them before guests arrived. 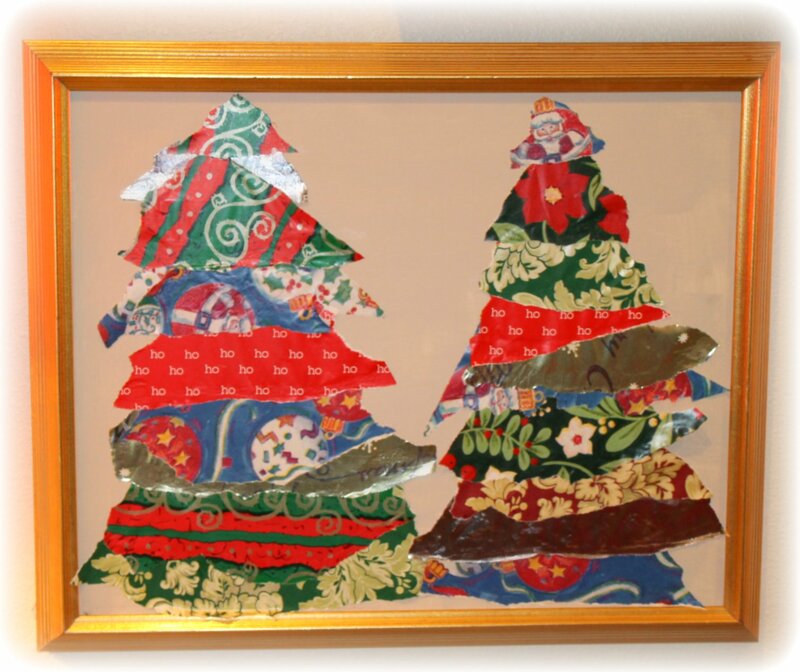 So she grabbed several rolls of gift wrap, tore off pieces and pasted them to the canvas to make Christmas trees. ANOTHER PICTURE OF THE QUICKIE DECORATING: Firmly anti-banality, Martha didn't try to match the gift wrap colors or patterns. She chose an assortment to keep it fun and interesting. 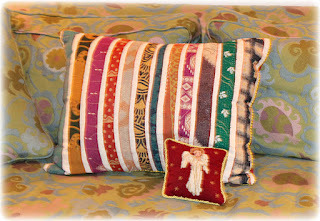 XMAS PILLOW: Part of why I thought the Christmas trees were folk art pieces is because these are Martha's holiday pillows - 1 small angel pillow and a larger pillow with multiple ethnic prints and textures. Some people might find the larger pillow a weird choice for a holiday pillow. While the pillow is not exactly traditional, the colors are repeated in other Christmas decor in her living room, plus here in Austin, keeping things a little weird and unexpected is very very desirable. 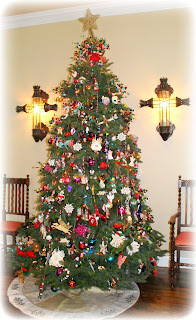 I hope you enjoyed Martha's joyful Christmas decorating. 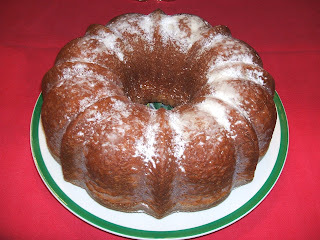 I want to thank her for sharing her home on the blog. *Waves to Martha* As I said, I hope to take pictures of her dining room table set for dinner, so there should be more pictures to share soon. Loved this post! I have brass candle sticks that I adore. Yes, Old world is the way I would describe them too. Welcome to blogging. 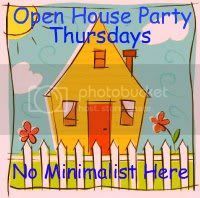 I am hosting a newbie party and would love to have you join in. Thank you for your complimentary comment. I agree Martha used brass candle sticks beautifully in her tablescape which shows it is about how they are used which matters. And yes, they can feel very old world. Thank you for the welcome to blogging. I would love to join in on your newbie party. I will check out your blog and see if I can find details. What a lovely home Martha has, and her kitchen rocks. Really love her white kitchen and her red holiday decor really make the kitchen pop. Love her tree, and easy decorating. 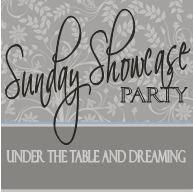 Hope you will share over at Sunday's Best Party going on now. Now following you. Thank you for your nice comment and for visiting our blog. I'm so glad you enjoyed the tour of Martha's Christmas decor. And yes, her kitchen is very cool. I will take your suggestion and link up. Beautiful!! I especially love the cute touches in the kitchen, but it's all perfect!! Going to look at the other home tours now! I'm your newest follower! 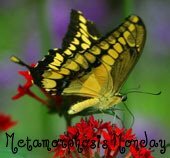 I would love for you to come by my blog and follow me back if you get a chance :). Found you through Debbiedoos newbie party. Thank you for your comment. I'm so glad you liked the entry. Martha's home is very cool and festive. 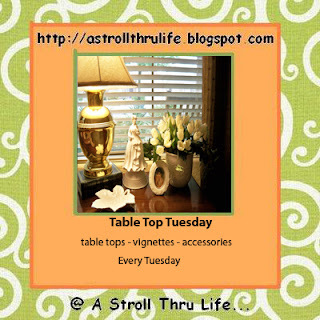 Thank you for visiting the blog and for following. I will definitely return the favor. Great job on the Christmas decor! Thank for your comment. 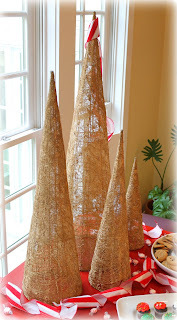 I totally agree, Martha did a great job on her Xmas decor. I was so happy to be able to share it with people here. Martha did do a great job. Looks as good as the first time I saw. 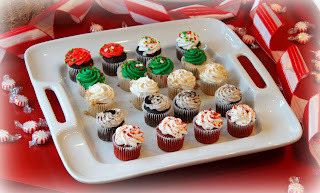 Thanks for sharing at Sunday's Best and wishing you Happy Holiday's. Thanks so much for visiting and leaving an encouraging comment. I am so glad you liked Martha's colorful Christmas decor. I like it so much too. Martha is one of my best friends. She doesn't put on airs, but she has so much personal style. She is a festive person and her decor reflects that. Thank you for visiting our blog and for leaving a nice comment. 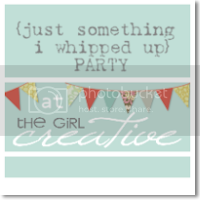 I have linked up the post at your blog link party. I enjoy your blog very much and have been inspired a lot by your projects to try more of my own. Thanks for sharing them.